Labor Day is a public holiday in the United States and is always celebrated on the first Monday of September. First proposed in 1882, it is meant as a celebration of American workers and perhaps based on the city of Toronto's labor festivals. There is some disagreement over who actually first came up with the idea of celebrating a labor day. It was either a man named Peter McGuire or Matthew McGuire. Both were the heads of labor groups at the time and are credited with the first proposals for the holiday. Some of the confusion may also be due to their similar names. In any event, someone named McGuire made the proposal and it created the holiday that we know today. 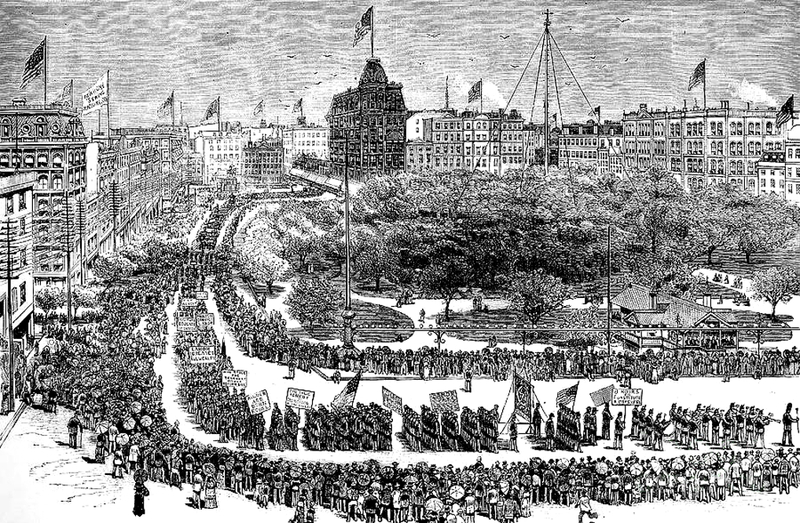 Labor Day was first celebrated in 1882 on September 5th, with a parade to "exhibit the strength of trade and labor organizations". By the late 1800s, the industrial revolution had altered the way work was done in the United States, Europe, and Japan. Many factories had sprung up quickly in the earlier part of the century. Most industrial workers at this time worked long hours in unsafe conditions. As time went on, workers began to organize unions and demand better working rights, and the concept of celebrating workers began to take hold. Oregon was the first U.S. State to make Labor Day an official holiday in 1887, and in 1894, the United States Congress voted Labor Day in as a federal holiday to be celebrated across the entire country. Most cities and towns hold some kind of Labor Day festival today. Often there are fireworks, music, and feasting. New York City holds the largest Labor Day Festival, also known as the West Indian Day Parade. This event attracts over a million spectators every year, many of the visitors travel from all over the U.S. and the Caribbean to march in or watch the colorful parade. The participants march in elaborate costumes and dance to the mostly Caribbean inspired music. The parade has come under criticism for breakouts of rowdiness and noise complaints in recent years, but the momentum to hold the parade is not soon to slow. Labor Day is also considered the symbolic end of summer. Most American children return to school after Labor Day, making it a bittersweet holiday for them. Some stores have Labor Day sales, since so many people are off of work that day and more likely to shop. Labor Day also tends to begin the American Football season with college and professional games beginning around this time. Some people organize their own celebrations as well. It is very common to have a cookout or party on Labor Day, so be on the lookout for any friends or coworkers who may be celebrating the holiday! It is great chance to show your appreciation and have a good time with the people around you.